This sandwich is a classic my mother used to make when I was a child. It is very easy, great for last minute things and perfect for when you are eating down your fridge to leave on vacation. It takes all of 5 minutes and you are out the door! This can be eaten for really any meal, making it very versatile. *We precook bacon and keep it in the fridge for when we need it. Just warm the bacon up before adding to the sandwich if you choose to use it. Place the two pieces of toast in the toaster. While the toast is toasting, slice the tomato into thin slices – you should get 4-6 slices out of one tomato. When the toast is done, pull it out of the toaster and spread 1 tbs of mayonnaise or goat cheese on one side of each piece of toast. 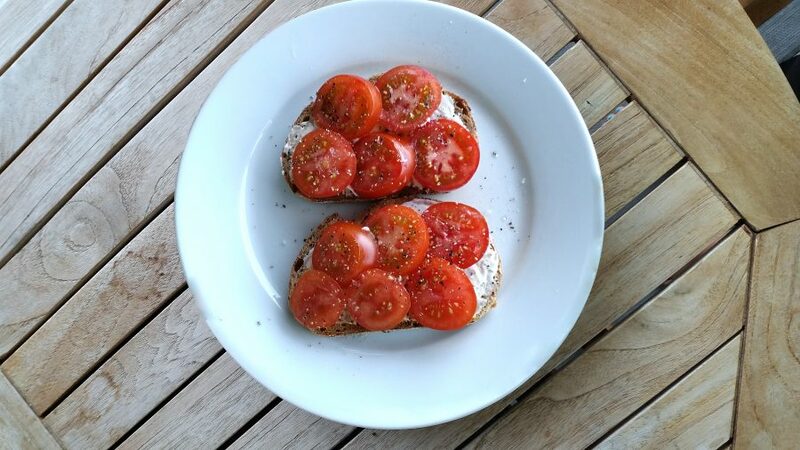 On one toast, layer the tomatoes so they all fit and season with salt and pepper. Add bacon if you wish. Place the other piece of toast on the tomato toast mayo-side down.